The glycemic index indicates how fast a high-carbohydrate food is digested into glucose and how much it causes blood glucose to rise. 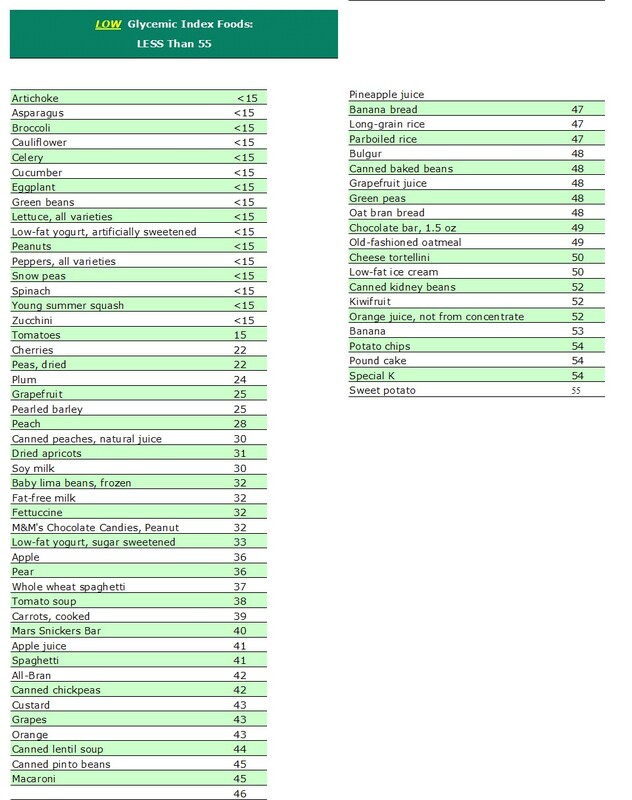 The index doesn't depend merely on whether the carbohydrates are simple (sugars) or complex (starches). Many factors come into play, including the amount of fiber and fat in the food, how refined the food is, how fast the food is digested, whether it was cooked, and what else is eaten with it. Table sugar and honey have a high glycemic index (meaning they have a strong effect on blood sugar). 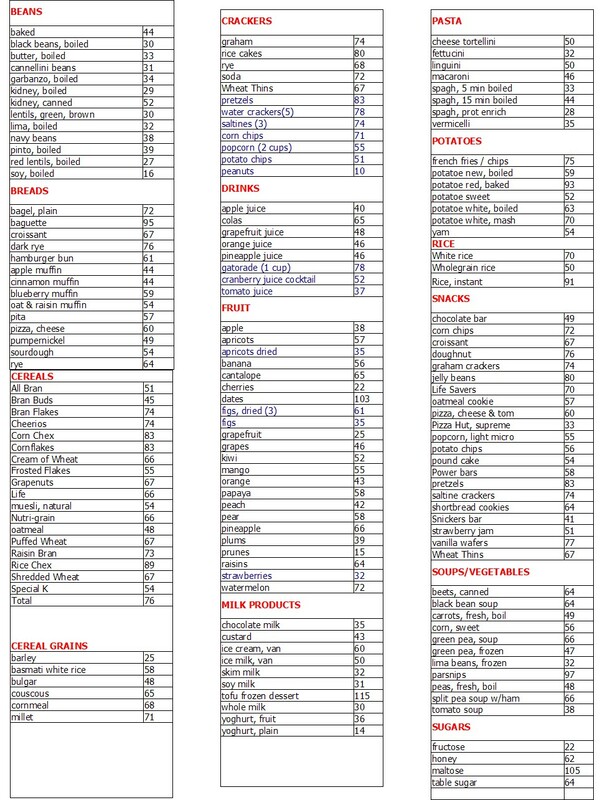 But so do raisins, corn, potatoes, carrots, white bread, instant rice, and most refined cereals. Though sweet, apples and peaches, as well as beans, grapefruit, and peanuts, have a low glycemic index. Pasta gets a middle rating, as does oatmeal. 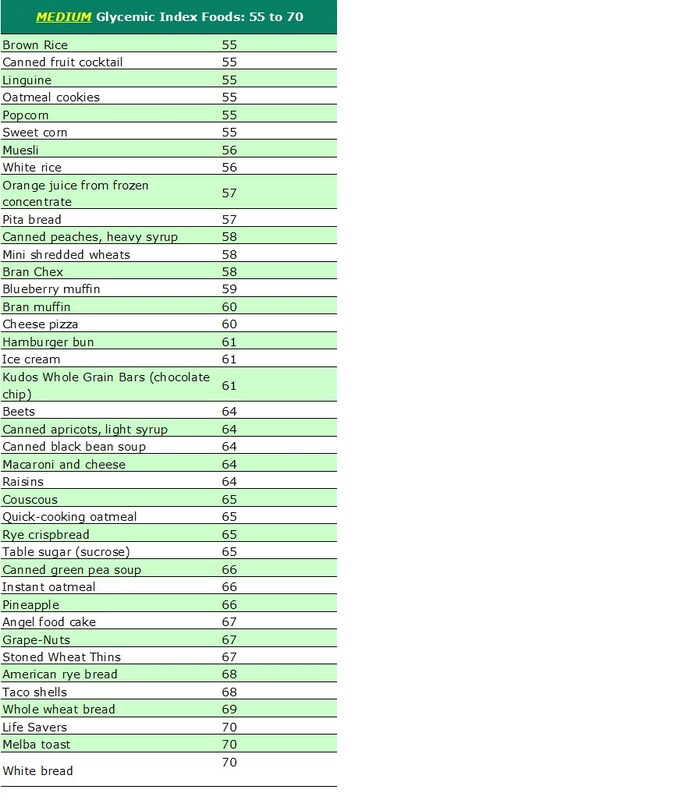 A number of factors determine a food's glycemic index. One of the most important is how highly processed its carbohydrates are. In highly processed carbohydrates, the outer bran and inner germ layer are removed from the original kernel of grain, which causes bigger spikes in blood sugar levels than would occur with less-processed grains. Whole-grain foods tend to have a lower glycemic index than their more highly processed counterparts. For example, white rice, which is highly processed, has a higher glycemic index than brown rice, which is less highly processed. Fiber content. Fiber helps shield the carbohydrates in food from immediate digestion, so the sugars in fiber-rich foods tend to be absorbed into the bloodstream more slowly. Ripeness. A ripe fruit or vegetable has a higher sugar content than one that is still green and, therefore, has a higher glycemic index. Type of starch. The type of starch granules in a food influences how fast the carbohydrates are digested and absorbed into the bloodstream. The starch in potatoes, for example, is digested and absorbed into the bloodstream relatively quickly. Fat content and acid content. The higher a food's fat content or acid content, the slower its carbohydrates are converted to sugar and absorbed into the bloodstream. Physical form. Finely ground flour has a higher glycemic index than more coarsely ground flour. 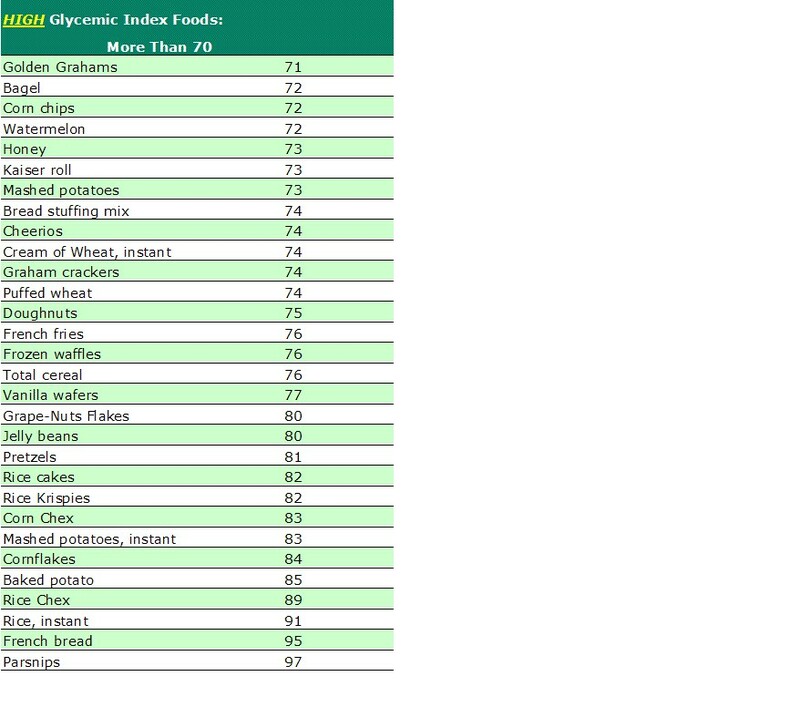 The glycemic index (GI) is a nutritional ranking system that measures how much certain foods affect blood sugar levels. Foods that are low on the glycemic index (such as oatmeal and bran cereal) raise blood sugar levels less than foods higher in GI, such as white bread and sugary cereals made with white flour. Some health experts maintain that eating low-GI foods may be an effective tool for preventing or managing obesity because low-GI foods are more satisfying and may reduce overall daily calorie intake. Researchers from Oxford Brookes University in England, studied how eating breakfasts of low-, medium-, and high-GI foods affected overall calorie intake. Thirty-seven 9- to 12-year-old children who typically ate breakfast and lunch at school participated in the study, and were divided into groups. Each week, a group of children would receive one of three test breakfasts for three consecutive days. The three test breakfasts included: 1) a low-GI breakfast with a choice of bran cereal, muesli, oatmeal, or whole-grain bread; 2) a low-GI breakfast plus added sugar; and 3) a high-GI breakfast with a choice of corn flakes, cocoa cereal, crispy rice cereal, or white bread. All of the test breakfasts also included milk and fruit juice. The children were instructed not to eat or drink again until lunchtime except for water and a small serving of fruit. Researchers then observed and calculated the caloric intake of the children during the lunch meal. The type of breakfast the children consumed significantly affected the amount of calories they consumed at lunchtime. When children ate low-GI or low-GI plus sugar breakfasts, they consumed fewer calories compared to when they ate high-GI or their typical breakfasts at home. Although the high-GI breakfast was rated as tastier than the low-GI breakfasts, children became hungry faster after eating the high-GI breakfast and ate more calories at lunchtime. What This Means to You: Eating a breakfast with low GI may keep kids satisfied longer and may reduce overall calories consumed. Low-GI foods include higher-fiber foods such as bran cereal, oatmeal, berries, and apples. If your child is frequently hungry before lunch, adding or substituting some low-GI foods for high-GI foods in his or her breakfast may lead to longer satisfaction. In addition, if your child's doctor has diagnosed your child as overweight or obese, your child's doctor may advise you to incorporate low-GI foods into your child's diet to reduce overall calorie intake. If you have questions about glycemic index or other aspects of your child's nutrition, talk to your child's doctor or a registered dietitian.